The patrol unit is comprised of ten sworn officers including two Sergeants. The Bellefonte Police have announced that they have put a police motorcycle into service on May 18, 2009. The motorcycle is a 2009 Suzuki V-Strom 650cc. The motorcycle will be used as an everyday patrol/emergency response vehicle. There will be, initially, three officers assigned to the motorcycle. Chief Weaver anticipates this unit to be a success and foresees more officers riding the motorcycle in future years. 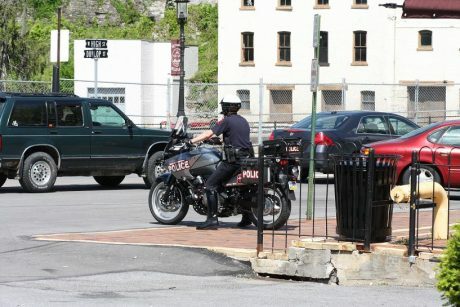 This is not a new concept in PA; however, this will mark the first time in Bellefonte’s history that a motorcycle will be patrolling the Borough’s streets. Officer Robert Igoe and Officer M. Todd Walter are assigned to the departments bicycle patrol unit.